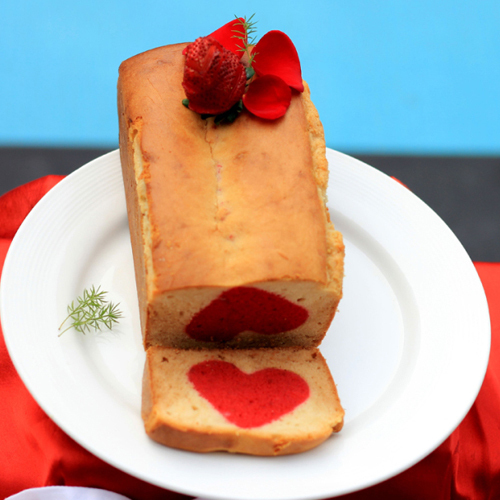 Slice into this delicious loaf cake and reveal the secret heart design running through the middle - a really romantic bake! Cook Time: 2 hrs. 20 mins. Heat oven to 160C/140C fan/gas 3. Grease a 900g loaf tin and line with a long strip of baking parchment. Cream 175g butter and 175g sugar until light and fluffy. Beat 3 of the eggs and pour in, a little at a time, mixing after each addition. Sift together 140 g flour, 1/2 tsp baking powder and the cocoa, then fold into the butter mixture along with the almonds. Combine 100ml milk, 11/2 tsp vanilla and all the food coloring and add to the batter, then mix until evenly coloured. Pour into the prepared loaf tin and bake for 1 hr 10 mins until a skewer comes out clean. Cool for 10 mins in the tin, then transfer to a wire rack. When cool, cut the cake into 4cm slices. Using a 5cm cutter, stamp out the hearts (save any remaining cake for another treat). Repeat step 1 to make a second cake mixture - you won't have cocoa or food colour in this batch. Pour 3/4 of the mixture into the prepared loaf tin. Push the bottoms of the hearts into the batter in a tightly packed row. Spoon over the remaining cake mixture, covering as much of the hearts as possible. bake for 1 hr or until a skewer comes out clean. Cool for 10 mins in the tin, then transfer to a wire rack to cool completely. For the icing, gently heat all the ingredients over a low heat until combined. Leave to cool, then chill until needed. Spread over the cooled cake and decorate with the sprinkles, if using. Will keep for 3 days stored in a cake tin.